A powerful upper low with a rather deep surface low centered NW of Iberian peninsula remains stationary and continues advecting deep moisture into western Mediterranean. Further NE, an extensive ridge is placed across the NE Europe and W Russia, while a gradually weakening upper low over S Balkans moves towards NW Turkey. A HIGH RISK has been issued for extreme southern France with threat for torrential excessive rainfall which could result in severe flooding. As a result of an upper low over Iberia, an unstable airmass will maintain across the warm western Mediterranean waters where instability well in excess of 2000 J/kg MLCAPE is expected. With rather strong LL flow from the SE, this airmass will be advecting inland into NE Iberia and S France. Around 1500 J/kg MLCAPE should be available there as well. Moderately strong deep and low level shear will support organized storms and especially intense multicells or clusters. Given the simulated conditions with stationary convergence and deep moisture advection onto the southern Massif Central mountains, it is becoming increasingly likely that training cells in combination with strong orographic rainfall will be maintained through the day and result in very high amounts of rainfall across the risk area. High resolution models simulate up to 200 mm or more of accumulated rain in 24 hours period. This will significantly enhance threat for damaging flash floods along the southern slopes and further south towards the Mediterranean coastal areas. In addition, strong ESE flow along the coastal areas around Montpelier should enhance the LL helicity and support tornadic storms especially given the combination of strong LL CAPE and low LCL along the NW Mediterranean. A strong tornado is possible. A MDT risk has been issued for surrounding areas of HIGH risk including extreme NE Spain with threat for excessive rainfall. Additionally, moderate shear and instability should support organized severe storms, including supercells with large to very hail, severe winds and some tornado threat. 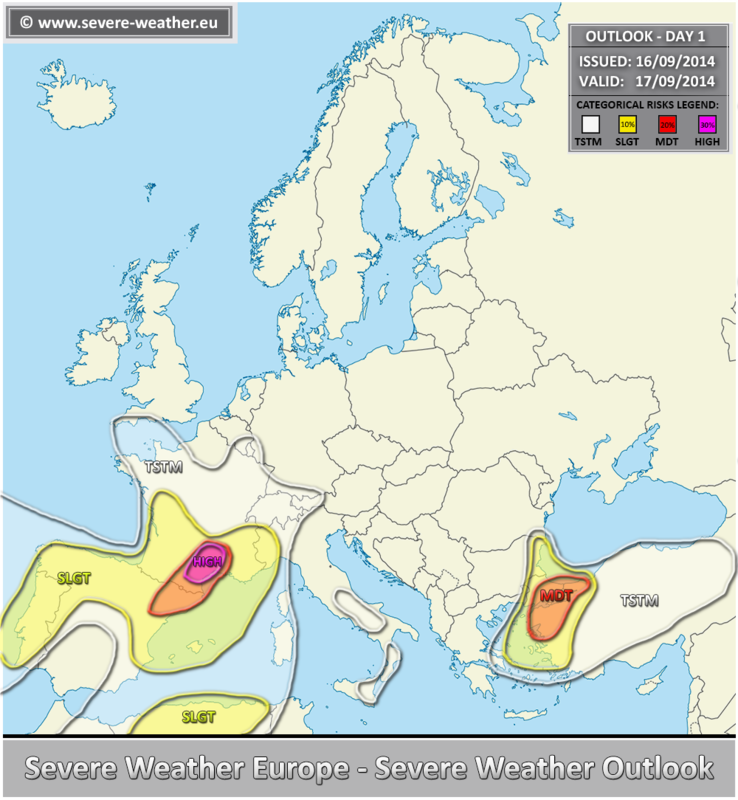 A SLGT risk has been issued for surrounding areas of HIGH/MDT risk including the N-W Iberia, NW Mediterranean, S France and NW Italy with threat for excessive rainfall and lesser extent for severe winds, large hail and tornado threat. A SLGT risk has been issued for N Algeria with threat for large hail, severe winds and torrential rainfall. A MDT risk has been issued for parts of NW Turkey with threat for excessive rainfall and high rain accumulations. A SLGT risk has been issued for surrounding areas of MDT risk including E Bulgaria, SE Greece and Aegean sea with threat for excessive rainfall, waterspouts and lesser extent for marginally large hail.